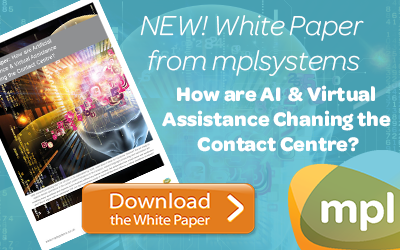 How are Artificial Intelligence & Virtual Assistance Changing the Contact Centre? Over the last 5 years, customer service has considerably evolved from the basic call centre, to the multi-channel contact centre, or even omni-channel customer engagement platform. But can the customer service department scale themselves to the incessant increase in customer questions? The answer is not simply to continue employing more members of staff to answer more questions from more channels, but rather to work in efficient and cost effective ways. The answer is to use Artificial Intelligence (AI) and Virtual Assistance (VA) to identify, process and respond to simple requests whilst reserving agents for more complex interactions. This paper will look at the technology options and recommend best practice accordingly. Trusted by many of Europe’s top businesses to manage their end to end omni channel customer journey, mplsystems are listed as a visionary in Gartner’s latest Contact Centre as a Service Magic Quadrant Europe. Contact Centre efficiency is transformed with our intelligent self-service solution, which uses AI and VA to provide a seamless digital engagement. Be the first to comment on "Artificial Intelligence is Changing the Contact Centre"